Today's Poinsettias will knock your socks off! Breeders are producing more beautiful hybrids than ever, many of them named for holiday foods. Plum Pudding. Christmas Cookie. Santa Claus Candy. Beautiful, but temperamental, these tender plants need some TLC to make it through the season in your home. There is certainly nothing wrong with the familiar old-fashioned red poinsettia. 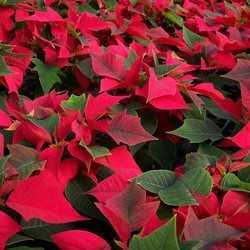 Easy to find, affordable, and a kick-start to the winter holiday season, these lovely plants bring back memories of Grandma's house at Christmastime. She placed a poinsettia on every windowsill and two large ones in the foyer--one on each side of the door. Then, along came the white poinsettias. She took it in stride and gave both plants equal display in her home. Wouldn't she be surprised to learn that today we have over 100 varieties! 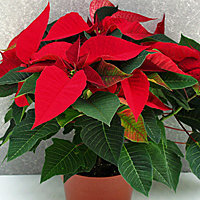 Though the poinsettia was known to the Aztecs as far back as the 14th century, the plant was introduced to the United States in 1825 by Joel Robert Poinsett, the first ambassador to Mexico. He brought cuttings to his home in South Carolina and, thereafter, the plant was named in his honor. Legend has it that the Poinsettia originated from a handful of weeds carried by a small Mexican girl who wanted a gift for the Christ child. As she approached the altar, the weeds blossomed into magnificent red flowers. 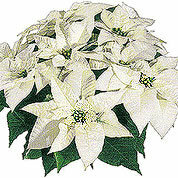 They became known as Flores de Noche Buena--Flowers of the Holy Night. Centuries later, we still enjoy this beauty during the December holiday season. 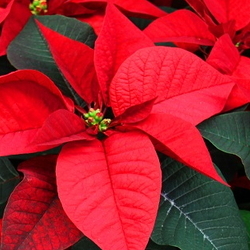 Poinsettias (Euphorbia pulcherrima) have long been accused of being highly toxic if ingested. Studies performed at Ohio State University refuted this claim once and for all, the findings indicating that, to be lethal, a 50-pound child would have to eat 500 to 600 leaves to exceed the experimental dose that revealed no toxicity danger. Another study at Children's Hospital in Pittsburgh and Carnegie Mellon University substantiated these findings. 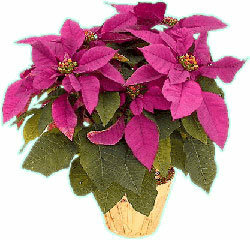 Poinsettias are not meant to be eaten, so ingestion could cause stomach distress, but nothing life-threatening. If you have a pet or youngster who nibbles things, keep the plant up where they can't reach it. Poinsettia sap has a very slight chance of irritating the skin of people with latex allergy. 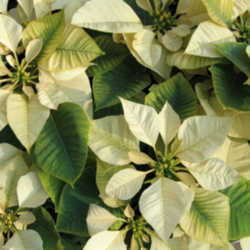 The Poinsettias that grow outdoors as shrubs are not the same as the Poinsettias offered by florists and nurseries. Native to Mexico, Poinsettias grow all over the world in warm, dry regions. 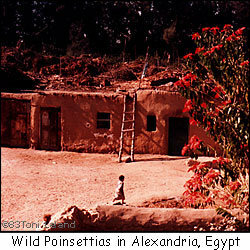 In Alexandria, Egypt, Poinsettia "trees" grow wild, towering 15 to 20 feet, their blooms measuring 8 to 10 inches across. 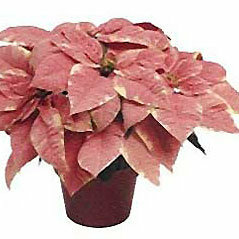 In the United States, Poinsettias only thrive as permanent outdoor plants in the southern and southwestern regions. In colder climates, Poinsettias can be planted in late spring for summer and fall interest, but will not survive freezing temperatures. 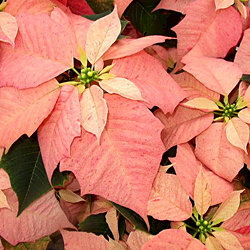 The Poinsettia "bloom" is not actually a flower, but rather a modified leaf called a bract. The "flowers" (cyathia) are the small yellow buttons in the center of the bract. Light. Keep your Poinsettia in a well-lit spot, such as a window sill or a bright room, for a minimum of 6 hours a day. Temperature. A very important point for keeping a Poinsettia happy in the home. Avoid setting the plant near drafty doors or windows. Do not leave it in a room without heat. Do not set it near heat ducts or radiators, or on top of the television. And most important, when you bring it home from the florist, protect it from the wind and cold air. Water. Allow the plant to dry out between waterings. Avoid over-watering and never allow the pot to sit in standing water. Spray the leaves with a fine mist of water frequently during the bloom period. 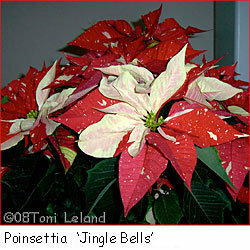 Poinsettias can be a seasonal obsession, or a long-term project. To learn more about getting your Poinsettia to reflower after the holidays, visit this link at Ohio State University Extension. To learn how to grow poinsettias outdoors in your landscape, click here. Toni Leland has been writing for over 20 years. As a spokesman for the Ohio State University Master Gardener program, she has written a biweekly newspaper column and is the editor of the Muskingum County MG newsletter, Connections; she currently writes for GRIT, Over the Back Fence, and Country Living magazines. She has been a gardener all her life, working soil all over the world. In her day job, she scripts and produces educational DVDs about caring for Miniature Horses, writes and edits books about them, and has published five novels.